Despite a 3-2 midweek win against Polish side ?l?sk Wroc?aw, United exited European competition on the away goals rule having lost the first leg of their Europa League second qualifying round tie 1-0 in Poland. 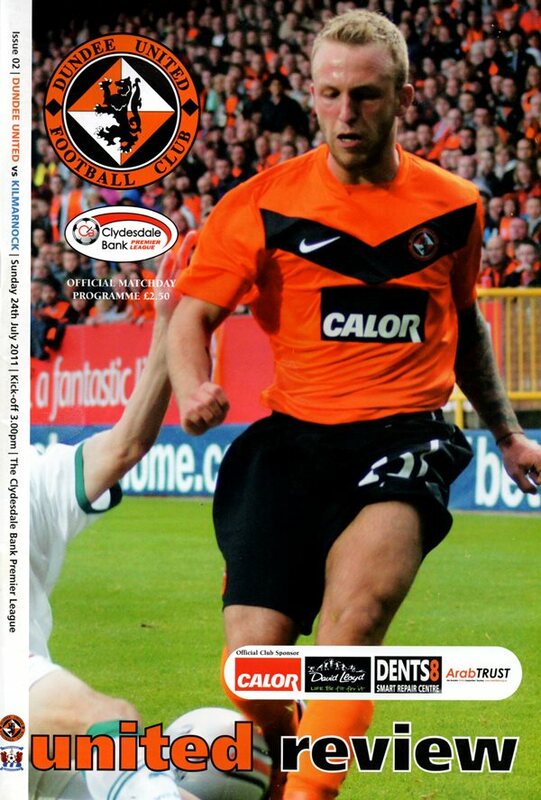 Peter Houston’s side were looking to make up for their European disappointment by getting their league campaign off to the best possible start with Kilmarnock the visitors to Tannadice on the opening weekend of the 2011/12 SPL season. This match saw the introduction of the all-tangerine kit – using the tangerine shorts originally intended for the away kit – which would be used for the majority of the season. Peter Houston made two changes from Thursday’s match against ?l?sk Wroc?aw with Garry Kenneth and Scott Severin dropping to the bench, in came Stuart Armstrong and Barry Douglas. Club captain Jon Daly – usually United’s target man - started the match in central defence. 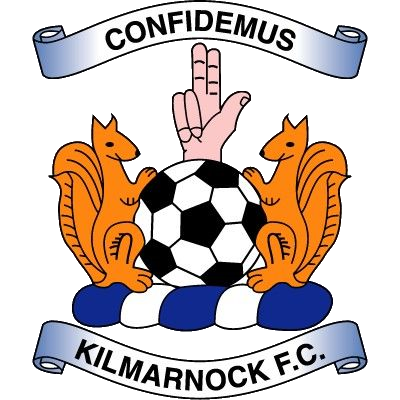 At the start of the game Kilmarnock were fielding five debutants and therefore it is hardly surprising that it took the Rugby Park side a while to settle into the match as United – shooting down the slope towards the Eddie Thompson Stand - dominated the opening exchanges. John Rankin – making his first league appearance in a tangerine jersey – was unlucky when his powerful, long-range, half volley flew just wide of Killie goalkeeper Cammy Bell’s left-hand upright. Rankin was making a good impression on the home crowd and he was involved again when he did well to hit the by-line before playing a ball to David Goodwillie at the near post. His weak effort was blocked by a Kilmarnock defender and Stuart Armstrong’s follow up shot was not powerful enough to pose any real threat to Cammy Bell. The away side slowly began creeping into the game and James Dayton went very close to giving Kilmarnock the lead, getting the better of Paul Dixon before dragging his shot just wide of Dušan Perniš’ right-hand post. Although Kilmarnock’s attackers were starting to get into their stride, their defence continued to look unconvincing with United exploiting the numerous gaps appearing in the Ayrshire side’s back four at every opportunity. A simple long ball down the field from Sean Dillon found Goodwillie onside and completely unmarked on the edge of the Kilmarnock penalty box. The young Scottish international controlled the ball brilliantly but Cammy Bell did well to force him to go round him away from goal and Goodwillie’s cut-back just evaded Barry Douglas who was lurking in front of goal. It wasn’t long before the lively Goodwillie was in the thick of the action once again: getting on the end of Paul Dixon’s wicked delivery into the box but his volley went just wide of the post. Kilmarnock were next to threaten: Gary Harkins met James Dayton’s delivery from a corner with a powerful header which Perniš did well to save and from the resulting ‘stramash’ in the penalty area Harkins’ rebound shot was blocked by his own player, Manuel Pascali. With half-time looming Cammy Bell was forced into action when one of his own defenders chested Johnny Russell’s cross into the box towards goal and the ball almost creeped into the bottom corner before Bell tipped the ball wide. 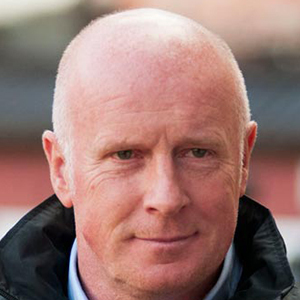 At half-time Peter Houston decided to change things, replacing young midfielder Stuart Armstrong with experienced defender Garry Kenneth which also saw Jon Daly move out of defence up field to his more familiar position as striker. However it was Kilmarnock who kicked off the second half with a renewed enthusiasm and took the lead in the 46th minute thanks to a superb 25 yard strike from new signing Rory McKeown after United had failed to clear a corner effectively. With United now chasing the game Peter Houston tried to spark his side into action with the introduction of Danny Swanson in place of the impressive Johnny Russell. Swanson was involved immediately, feeding the ball to Goodwillie who was denied by a last gasp challenge from Ada the Kilmarnock defender. Houston then made his third and final substitution with the introduction of new signing Gary Mackay-Steven in place of Barry Douglas. Mackay-Steven’s first involvement was to whip in a brilliant cross to the far post where Goodwillie attempted a spectacular bicycle kick which didn’t come off on this occasion. United went close again with Jon Daly rising highest at a corner to head the ball towards goal but Ada was on hand to block the ball on the line. It was only a matter of time before the equaliser arrived and when it did it was spectacular. Jon Daly won a free-kick around 20 yards from goal and although Danny Swanson's initial effort was poor – crashing straight into the Killie wall – he made no mistake with the rebound, lashing it hard past Cammy Bell into the bottom left-hand corner of the goalkeeper’s net to make 1-1 with only twenty minutes remaining. United were now determined to score another goal but there task was made harder when they were reduced to ten men after substitute Mackay-Steven turned his ankle in front of the dug-outs under minimal pressure from Tim Clancy. As Mackay-Steven was helped off the pitch the Kilmarnock fans took some time to give David Goodwillie a barrel-load of abuse as he stood in front of the away section. He responded by almost scoring straight from the resumption of play: beating three Kilmarnock defenders before seeing his shot on goal deflected just wide of the post. Goodwillie had another great chance to win the match for United right at the death after being played through on goal by a brilliant first time pass from Jon Daly but Cammy Bell was alert enough to come of his line and dive at Goodwillie’s feet before he could put the ball in the net. This afternoon we open our SPL campaign against a much-changed Kilmarnock side. Because of that we have watched them at every opportunity. Paul Hegarty, Stevie Campbell and myself, all having taken in pre-season games. So we know what to expect and from what we have seen they like to get the ball down and pass it, which is very much the same philosophy that Kenny Shiels and Mixu Paatelainen created last season, bring them a successful season. But when you bring in so many players, no matter how good, it takes time for them to gel, or at least that is what I hope! Over the past couple of years, we have enjoyed some great encounters against Killie, and were fortunate enough to lose to them last season. Indeed, one of our best performances, for an hour at any rate, was on their last visit post-split when we went four up before they pegged back a couple of goals. But there again we can't judge too much on that because there we probably won't be facing too many players who were involved in that last game. Not to mention the fact that we too have undergone a lot of changes, though almost exclusively in the middle of the park. Whilst the outcome may be difficult to predict, the way they play isn't because it is been publicly stated that they'll play the ball out form the back and that should make for another highly entertaining affair. Having started the season away to Slask Wroclaw without three regular first teamers, the injury situation has improved with Garry Kenneth returning to the side with Danny Swanson sufficiently improved to be on the bench on Thursday. That leaves us with Scott Robertson as the only absentee as we start the league campaign. His ankle injury is coming on fine. The swelling is coming down, but it is still tender and sore, so it will be a wee while before he is back in the fray. Of course, we go into this match on the back of our Europa League exit at the hands of Slask Wroclaw on Thursday. But we have nothing to be ashamed of. No doubt an issue will be made about another Scottish team going out in the early rounds, but I don't think that's fair. It took a wonder goal to beat us and then only on away goals to the team that were runners-up in Poland last season. We had two glorious chances away from home in the first leg last week and that's what has killed us. I am gutted for the players because they put everything into the game. And the best way to get any disappointment out of their system is by getting three points on board and knowing them they'll be desperate to do just that, but we know it won't be easy.